Never Ever Do These 8 Common Face Washing Mistakes Again! Believe us, you have been washing your face all wrong! Well, we know the word ‘washing’ is pretty self-explanatory. But if you are yet to know the little ‘secrets’ of washing the face the right way, you are basically keeping your skin from looking its best. So, here we are to help you avoid the most common face washing mistakes and unveil the secrets to get a gorgeous skin. Read on. No two persons have the same skin. So, you need to find out the ideal cleanser that would suit your skin type the best. Choosing the wrong products will do more harm to your skin than good. Soap-based cleansers can make any skin dry, irritated, and even inflamed by stripping off its natural oils. Rather, a pH-balanced non-soap cleanser is the best choice that can make your skin absolutely free of dirt, microbes, and additional oil without being too harsh or too gentle to it. It will hydrate the skin and replenish its natural protective barrier for ensuring the utmost health. If you have a dry skin, choose a cream-based cleanser to induce enough moisture into it while cleansing. If you have an oily skin, opt for a foaming or gel-based cleanser containing alpha-hydroxy acids or salicylic acids. If you have a sensitive skin, pick a mild herbal cleanser to avoid irritation. Almost 80% of people do not wash their hands prior to washing their faces. But overlooking this step can transmit all those germs and grime from your palms to your face, thereby making your efforts pointless. In addition, when you rub in your cleanser wrong with dirty hands, you fail to give your face a good massage by putting proper pressure. So, always wash your hands thoroughly before starting the face clean-up procedure and massage your face the right way to get the most effective results. Follow small circular motions to rub the cleanser in your skin so that the blood flow gets stimulated throughout the face and wastes get removed from the tissues through the lymph. Put gentle pressure with the tips of your fingers while going upward and outward simultaneously in order to prevent the skin from sagging. Well, using the cleanser on the dry face is a strict no-no. It turns the whole affair extremely harsh by stripping natural oils away from the skin and drying it out too much. Also, you may need to rub the cleanser too vigorously on the dry skin, which is again a bad practice. So, it is advised that you always moisten your face right before applying the cleanser to the skin. This will help the cleanser spread easily and the skin will also get rid of impurities without aggressive scrubbing. There is a myth that hot water opens up our skin pores while cold water closes them. It makes many of us use too hot or too cold water for washing the face. But the truth is that our skin pores cannot be opened or closed as they do not contain muscle fibers. Rather, the application of smoking hot or icy cold water to the delicate facial skin can shock it to the core by snatching away its natural moisture. This ends up breaking the blood capillaries and making the veins visible. Hence, always use lukewarm water for washing your face. Do not use just any washcloth for wiping your face after washing. It may be full of dust, soil, and bacteria, which can cause considerable damages to your skin. Try to use a new washcloth for every single wash or at least change the existing one every couple of days. It is essential to avoid moistness and keep bacteria at bay for the safety of your skin. However, one-washcloth-a-day might not be possible for all of us. So, you must keep your washcloth clean by washing it every day. Also, ensure that your washcloth is soft enough. Anything overly abrasive (fibers can be felt easily) will be rough on your skin. Just because you need to wipe water from your face does not mean you have to rub your skin dry with the washcloth. It will ruin the surface layer of your delicate facial skin by tugging and pulling, which will eventually affect its elasticity. Moreover, rubbing a washcloth against the facial skin will cause damages to the outermost barrier of the skin by removing lipids, proteins, and fatty acids from it. Simply pat dry the face with the washcloth and stay beautiful by keeping that protective barrier of the skin intact. It is of utmost importance that you rinse your face thoroughly to eliminate all the traces of the cleanser from it. There are certain areas, such as both sides of the nose, hairline, neck, jawline, etc., which we forget to focus on and hence, the residues of cleanser get accumulated at those places. Such build-ups easily clog the pores, make the skin irritated, and cause breakouts. Therefore, make sure that you rinse your face well after using the cleanser. 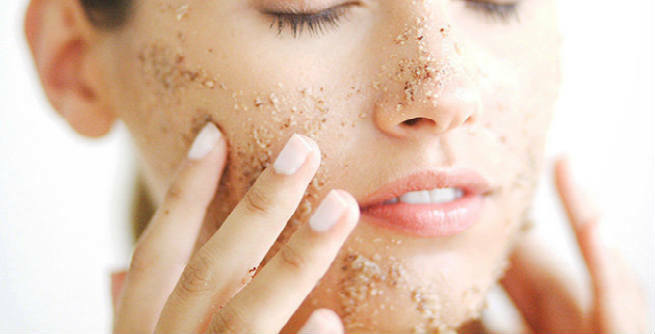 There is no need for exfoliating your skin each time you wash it. Exfoliating daily or too often can certainly give you that ‘squeaky clean feeling’ but the ‘irritation’ caused by dryness and flakiness will also come free with it! Generally, over-exfoliation takes a toll on the inner layers of the skin while removing the surface layer of dead cells. Scrubbing the face once or twice a week with a gentle scrub is enough to keep your skin healthy and glowing. Never ever replace your regular face washing regimen completely with commercial facial wipes. They might come handy while you are running out of time, but they are actually loaded with chemicals. Do not go overboard with your normal face washing practice. Washing your face twice a day – during your morning and nighttime skincare regimens – is enough to give you a gorgeous skin. Once you are done washing your face, moisturize it immediately. Try to put your moisturizer on your wet face as it will help you lock the moisture in your skin the most.